This is the first time I've participated in the monthly Foliage Follow Up hosted by Pam over at Digging. I don't tend to remember to take foliage shots, but I took a few this past month. We has so much unseasonable sunshine this past month, it had me, a lover of rain and misty days, feeling the world was a tad too bright for April / Early May. The sun brought out the full color of my 'Fireglow' Japanese Maple. The color becomes more stunning into the fall season. Many of the plants in my shade garden, such as the Hakone Grass above, found themselves in the spotlight. 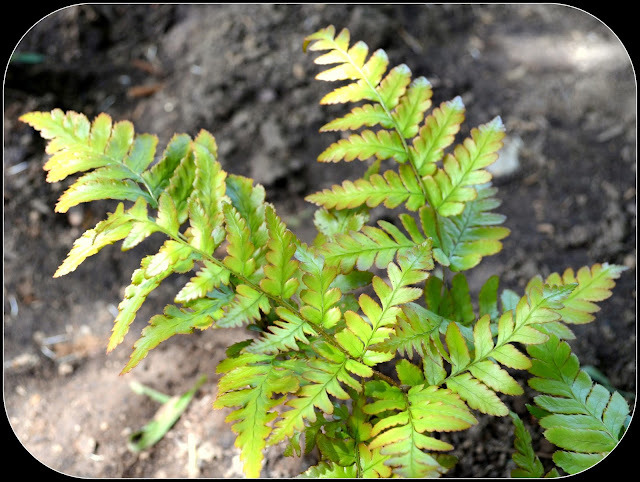 This is my first year growing an Autumn fern and I have not been disappointed. The reddish - orange tips of the leaves are quite striking. My poor Heucherella 'Sweet Tea' was purchased over a year ago and sat in it's pot for nearly a year before the shade garden beds were dug up and it's home was ready. It's brought forth a few new leaves but I hope next year, it will really begin to shine. Miracle was a recent acquisition, a gift from my friend Alison over at Bonney Lassie blog. The chartreuse tips on the rhubarb red leaves are stunning. I'm beginning to develop a great appreciate for foliage. Swing on over to Digging for more bloggers sharing their foliage finds of the month. That is a great shot of the Hakone grass! I really wish I had gotten some good closeups of your shade bed, when I visited. Next time, when the plants are even more established. That Heucherella will definitely put on some growth now that it's in the ground. You keep on showing us more and more beautiful plants, Jenni. Just how big is your garden??? Hi Mark, my new gardens are huge. I am nearly overwhelmed at times. I'm trying to stay focused on just adding a few projects a year. 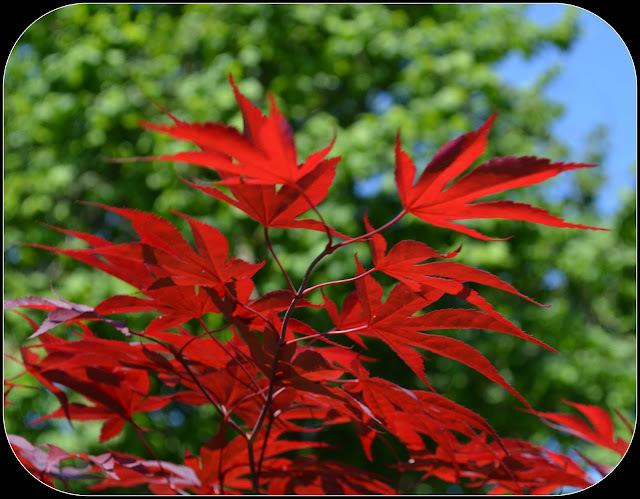 The red of that maple is so intense and beautiful with the sun shining through it! All of your foliage looks fabulous! There are few plants that can compete with a Japanese Maple for beautiful foliage (and, luckily, form)! I took shots this morning of my foliage..since it's so fresh and pretty this time of the year. Jenni, horray I see that the comments come through despite the fail emails back to me. 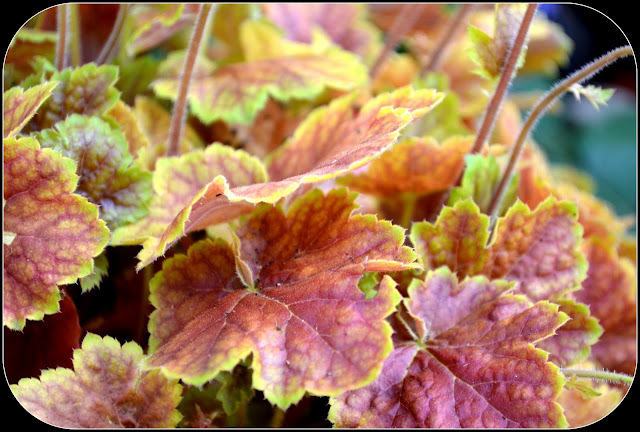 Beautiful heucheras--I wish the colorful-foliage types were easier in my climate--must envy yours! You say the maple becomes more stunning in the fall...how can that be? You'd better not show it, or we will be blinded. Congratulations on a fine inaugural Foliage Follow-up post. 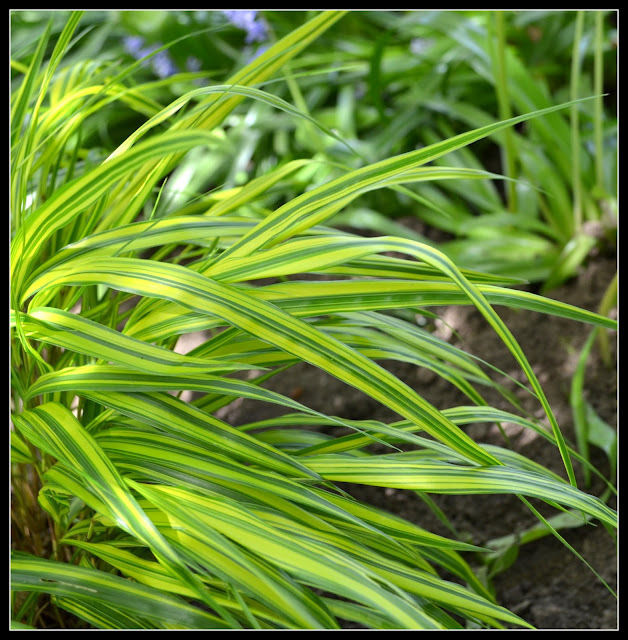 Beautiful foliage plants! The Maple took my breath away. That's not a sight I see here, of course. 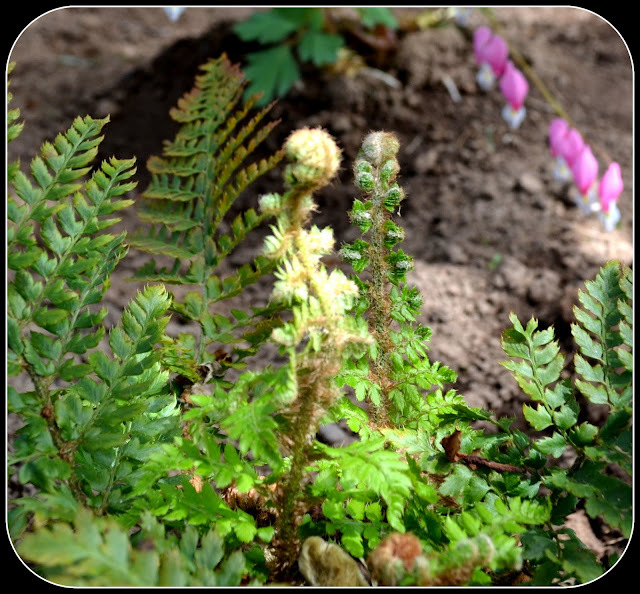 I also loved the ferns. I love it when the fern fronds are just beginning to unfurl. Such efficient packing! 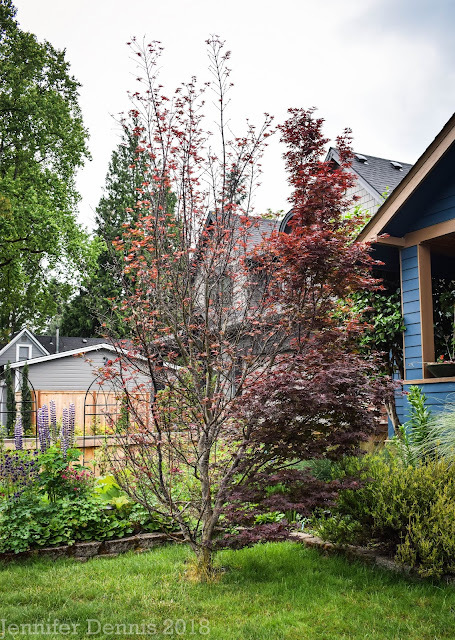 Love your photos... especially the Japanese maple! I can never seem to capture the fire of the backlit Japanese maple leaves without completely burning out the picture, but you show yours off beautifully. Beautiful photos and fabulous foliage! I love that Heucherella 'Sweet Tea'. Great color! Oh that foliage, an under appreciated part of gardening, I sometimes forget how important it is to plant for it alone. Your post has reminded me of some work I need to get done. I love the heucheras, pops of color in the shade! I enjoyed your beautiful photos! 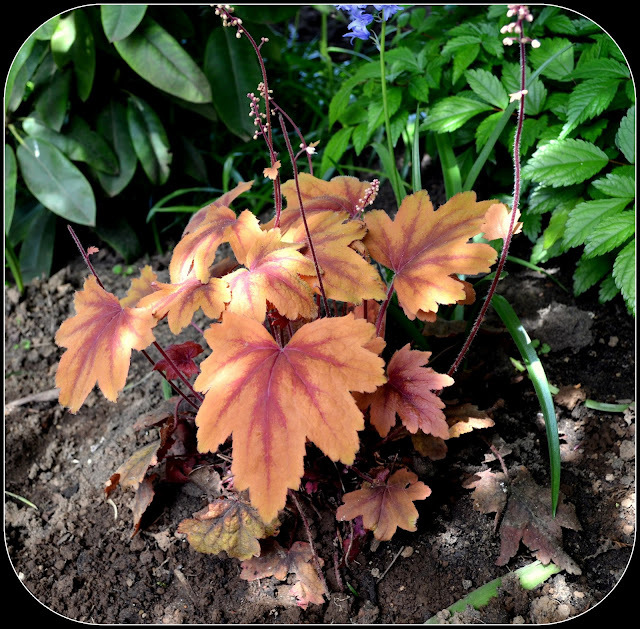 You highlighted some really pretty foliage for this month's posting, especially that delicious Heuchera. Thanks for joining in this time!